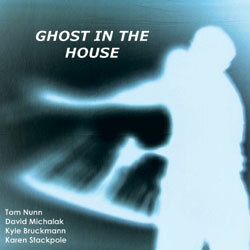 Conceived by filmmaker & musician David Michalak, Ghost in the House explores the ethereal and elemental soundscapes where music suggests an image. Stackpole’s small distinct sounds and swelling gongs resonate with Nunn’s sculptural inventions creating other worldly scenarios with texture and guidance from Bruckmann’s ominous horns and Michalak’s haunting lap steel. 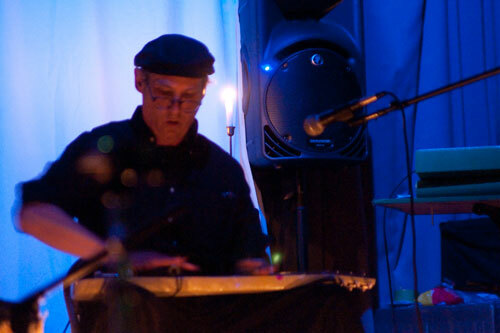 David Michalak plays a Fender lap steel guitar and an assortment of odd percussion instruments. While he is more commonly known as a filmmaker (50 films with original soundtracks since 1971), the visual art side of him seeps inherently into his solo performances and group compositions, which are characterized by shimmering passages, abstract snapshots and haunting representations of natural elements. David plays in his instrumental ensembles Reel Change and Ghost In The House as well as the duo, Dr. Bob. Some musicians that he is currently performing with are: Tom Nunn, Andrew Voigt, Bob Marsh, Carla Kihlstedt, Karen Stackpole and Kyle Bruckman. With a history of conservatory training gone awry, oboist and electronic musician Kyle Bruckman combines the rigorous discipline of a classical foundation with raucous sensibilities more indebted to punk's aftermath in a dizzying variety of artistic endeavors. He has performed throughout the U.S. and Europe as a composer, an interpreter, and an improviser and has appeared on more than 30 albums of various genres. Karen Stackpole performs and records with metals/gongs duo Euphonics, Dean Santomieri, Ron Thompson, Myles Boisen, Moe Staiano, and John Schott’s Ensemble Diglossia as well as collaborating on various other projects. Gongs and resonance are the calling. Small distinct sounds (a la insect music) and use of silence and space rank high also. She is the drummer for Cactus Motel and has played with Malcolm Mooney and The Tenth Planet, Moxie, Bolshoi Rodeo, and Rare Thing. She is the percussionist for the improvising quartet, Vorticella. Her percussive efforts include work with the Onsite Dance Company and the San Francisco Shin Taido group. Karen also operates Stray Dog Recording Services and works as a freelance writer for DRUM! and Electronic Musician magazines. In addition to the nearly 100 instruments he has made, Tom has performed extensively throughout the San Francisco Bay Area for over 25 years, as well as in other parts of the U.S., Canada and Europe, both as soloist and with other musicians. Tom has performed with the groups Rotodoti, Off Ramp, Stritch, Twine, Toax, Reel Change and Ghost In The House, and currently works with Axallto and RTD3.